This high-performance 2.75-mil, 7-year solvent-based inkjet media features a brilliant gloss-white surface that produces vivid, colorful prints. Its solvent-based, grey-pigmented, re-positionable adhesive and conformability characteristics make it a great choice for vehicle graphics, including wraps of vehicles with simple to medium-complexity curved surfaces. 3551RA features and advanced air-release liner and a solvent-based, grey-pigmented repositionable adhesive to make smooth application a breeze. Removable with little or no adhesive residue for up to four years. Available in a white gloss finish and transparent. 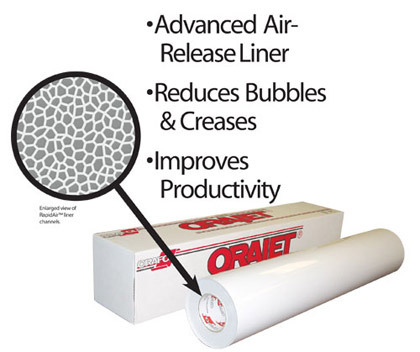 Recommended for use with ORAGUARD® Series 215, 240, 290, 290F, 293, and 297F laminating films. (FINAT TM-14)adhered to steel, no shrinkage in cross direction; in length <.08"